Sectional Balance Beam. Add more sections to increase length. Our connectible sectional balance beams are fun to use, quick to configure and easy to store. 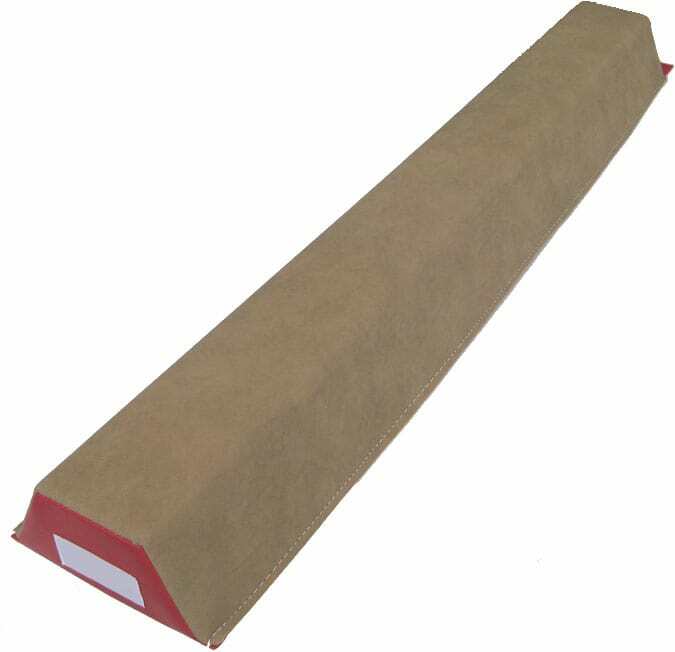 Each practice beam is covered with the same synthetic suede as official competition equipment and filled with very solid (but very light weight) crosslink foam. 4" wide top surface tapers to a 6" wide base. Beams connect end-to-end securely with permanently attached hook & loop (like Velcro) fasteners. 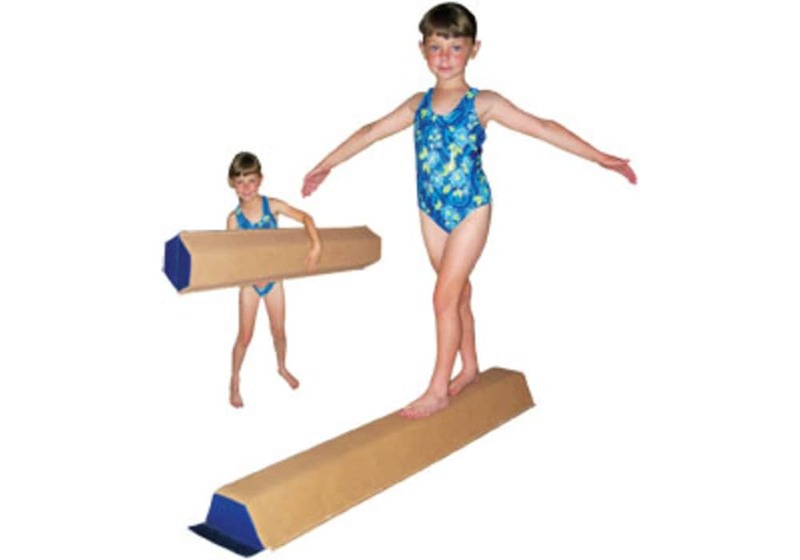 Excellent for gym or home use and sturdy enough to practice fundamental gymnastic routines. Create a beam training station that is extremely long and low, or create a series of shorter beams to maximize the useable space in your home or gym. Add as many 4' or 6' long sections as desired. Covered with the same synthetic suede as official competition equipment. 4" wide top working surface tapers to 6" wide bottom for stability. Intended for floor use only. Cannot be raised with low beam legs. 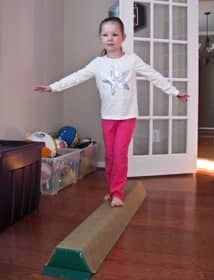 Height: 4"
Our connectible sectional balance beams are fun to use, quick to configure and easy to store. Each practice beam is covered with the same synthetic suede as official competition equipment and filled with very solid (but very light weight) crosslink foam. 4" wide top surface tapers to a 6" wide base. Beams connect end-to-end securely with permanently attached hook & loop (like Velcro) fasteners. Excellent for gym or home use and sturdy enough to practice fundamental gymnastic routines. Create a beam training station that is extremely long and low, or create a series of shorter beams to maximize the useable space in your home or gym. 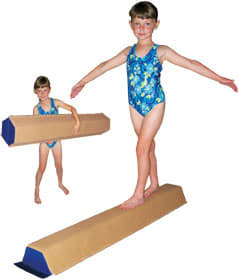 To order one or more folding mats to be placed on each side of the beam, go to our Gymnastics Folding Mats section. Add as many 4' or 6' sections as desired. Covered with the same synthetic suede as official competition equipment. 4" wide top working surface tapers to 6" wide bottom for stability. Intended for floor use only. Cannot be raised with low beam legs. Length: 4' or 6' long. Weight: Approx. 8 lbs. or 12 lbs. Shipping included within the contiguous USA. Allow approx. 2-3 weeks for production and delivery (less if in stock).